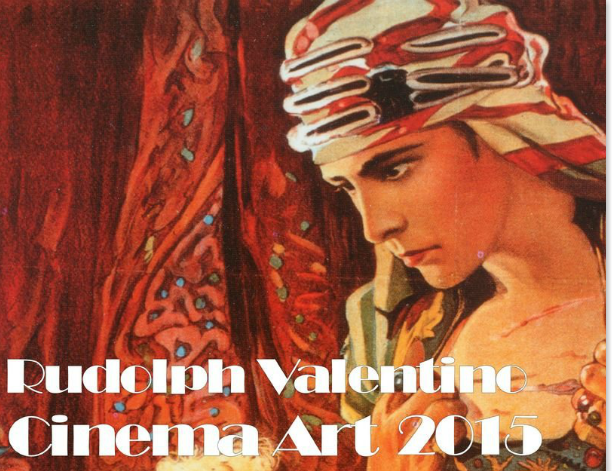 Rudolph Valentino did go home again and again. This book was one that I thoroughly enjoyed reading. It gave me further insight to his thoughts and feelings. Time after time it still proves that he still has fans that still are that. In 1923, through Rudolph’s close friend and business manager George Ullman, he wrote a book of poetry called “Day Dreams”. 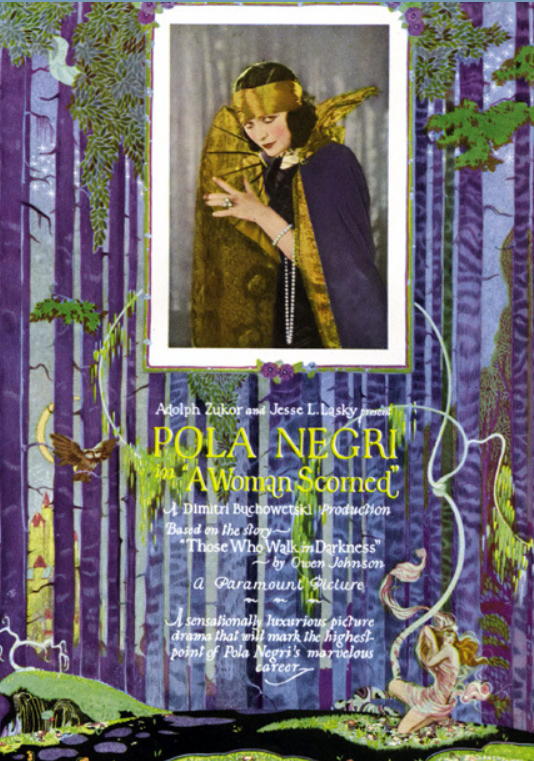 Rudolph Valentino did not claim to write this book. Although he did note through mediums and inspired by the people whose initials appear under each title is how this precious book came to be. In the books preface he writes “Just dreams Day Dreams a bit of romance, a bit of sentimentalism, a bit of philosophy, not studied but acquired by constant observation of the greatest of all masters Nature! I took to dreams to forget the tediousness of worldly strife and the boredom of jurisprudence’s pedantic etiquette.” This book has special meaning to me. 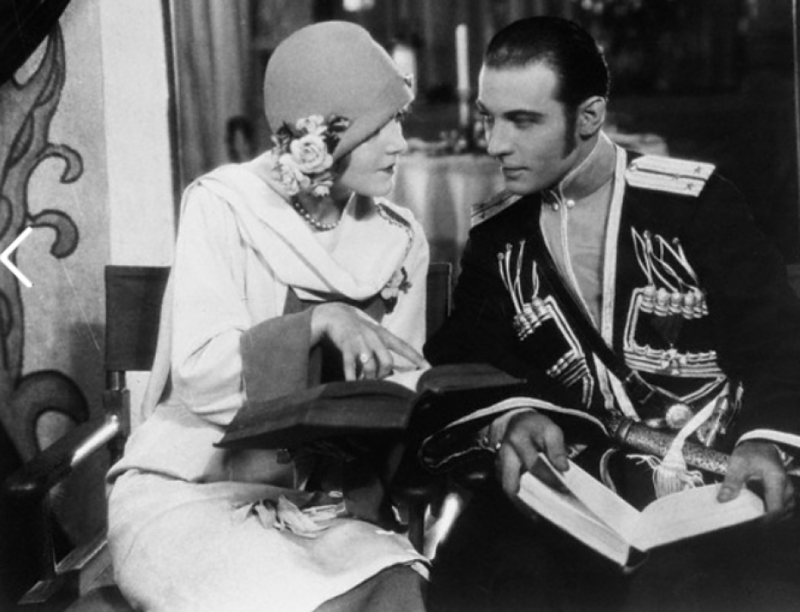 Rudolph Valentino through his gift of authorship and his presence on the screen gave the world what it badly needed was a dose of old fashion romance. Romance that escape from reality where a woman has a place that she can escape to. Day dreams where a dream can be what she wants it to be one of romance, fun, and frivolity. There is a quote Rudolph Valentino said about himself and daydreams. “Women are not in love with me but with the picture of me on the screen. I am merely the canvas upon which the women paint their dreams.” In every magazine article, in every movie was a love story to eagerly see. Where the man gets the girl and they all live happily ever after. In his last movie, “The Son of the Sheik” I remember one line which makes me smile “Why fear me dearest? Love such as mine can do no harm”. After all these years, in my dreams I can make you mine. In reality, you yearned for love. In my dreams, I gave you love, and made all of your inner desires come true. I thought I would include a poem from Rudolph Valentino’s book “Day Dreams” which true symbolizes how I feel. the glory of a flaming rose. Pressed close to the mountainside lay the home of Rudolph Valentino. Well had he named it Falcon’s Lair, for a wild falcon might have nested there and found security. The long winding road led up to the white rough-plastered house with its gates of Italian Grill work and its fountain where the laughing waters sang of love. Far below, lay the city of Los Angeles, and in the nearby hills the homes of the favourites of the films were visible. At the foot of the hill, lay the place that was dear to the hear of the young actor, the stable where his beautiful horses were stalled; four noble animals, two jet black and two of silvered gray, Firefly and Yacqui, Haround and Ramadan. Something was missing, something they waited for. The hand of their master was gone and they knew it, sensed it in their wise animal way. A dog barked at the sound of strange feet and all the road echoed his protest. Up where the open door proclaimed to the world a house without a master the people flocked. They came to see the home of the idol of the screen, Rudolph Valentino lover of lovers. Old men sighed as they looked at the guns upon the walls. Young men saw the glory of armor in all its ancient beauty; fine pierced helmets of the long ago; breast plates and spear and a glove made for a warriors hand. Everywhere the masculinity of the dead star was expressed by armor and the things that are made for warriors. It seemed to fill the house with a low murmur, as if men of old had been urged back to knightly revel with the dead boy who longed for such compassioning. Lamps stood here and there about the house, and upon the parchment shades a scroll of music met the eye. The rooms, so closely intimate, were rich with an imperial beauty; for all the wood was master-carved by men long ago. Soft velvets pressed close by years of contact were laid upon the hearth old iron was used to give age as well as beauty. Upon a block of black marble a sculptured hand gleamed white and ghostly, the hand of the dead boy who came up the ladder of fame so quickly, a strong hand with a long sweep from forefinger to thumb, an artists hand with sensitive fingers, sensitive even in the cold alabaster; fine and strong and of generous lines is this sculptured hand of Valentino by Prince Troubetskoy. There is pathos in its empty palm, for death came as swiftly as fame and folded the strong hands into repose. From the long windows came the great call to the eye of the master: behold the earth how marvelous and how fair. Music and books were in the room with its beams of oak present close to the low ceiling; but even here swords lay upon the piano swords crusted with jewels and whispering of war and love, and a hand sure and strong. Upon the wall beside the door stood the full-length painting of the men who had called to those sands, and upon his painted picture a gleam of the drying sun shed a tender light. In the dark eyes was a tenderness, and upon the full lips a little smile as if to say “You are welcome” Living and dead he called them, this mean who has gone into the shadows. Thousands of people pressed the floors of his house. They gazed fascinated at the place where he lived his life. Three rooms upon the top floor and three below. The house was small, yet it held so many treasures and old desk with lovely ivory inserts and little figures standing out in rich, warm tints, each one a gem of carving. The Black Falcon companion picture to Rudolph Valentino seemed to dominate the house, the brooding eyes, the strong, firm mouth and the well-knit figure were a challenge to the imagination. What manner of man was this; and why his name Black Falcon? Books ah yes the books that spoke of the man and his tastes better than all the other things in this house of 1000 wonders. There they stood, those wonderful books “Wooings and Weddings in many lands”. “Perfume of the Rainbow”, “Costumes of the Courts of Rome”, “Modern Dancing and Dancers”, “Ancient Costumes of Great Britain and Ireland”, and some little books, not costly that were labeled “Italian English Dictionary”. Rows upon rows of beautiful books. The eyes in the painting seemed to rest tenderly upon the volumes there in the cases beside the open fire. Many dreams had the dead actor dreamed there in his mountain home. Many starry nights had he dreamed there of great parts in great plays that would bring men and women in throngs to pleasure in his art. He dreamed his dreams but never had his vision assembled so great a throng as this: men and women, old and young, rich and poor, good and bad, climbing the mountain road, panting and weary to gaze upon his home, and upon his face, there in its frame of gold. Silently the great crowds passed through the little house, with its garden sundial telling off the hours and little whispers filled the air. “I loved to see him” said an old lady “he was a gallant boy”. Men looked at the guns upon the wall and sighed again. Young and beautiful girls looked down at the case of little rings and studs longing to possess some token of the lover who rode away from the people too soon. His art called to the women who loved romance. He captured for those some illusion they felt would keep. And men who loved to read of knightly deeds of daring and gay amors shut out their petty cares and lived with him upon the screen. His magnetic force drew them to him and his dynamic force drove him on. All the possessions of the man bespoke of his desire for something that is slipping away, a knighthood of other days, a questing that calls to men to unsheathe a blade for weal or woe. Cars, and still more cars, climb the winding road, for thousands are determined to seize the opportunity to satisfy their curiosity and peep behind the scenes of the actors life. There is only a quiet grief upon their faces as they look into the dead mans place of retreat; something of the grandeur of death. The mountains creep over them and sudden them; and in this quiet hush is the greatest applause that Rudolph Valentino ever had. The dead actor lives still, and the people come silently thanking him for the gift of his art. In the stable the horse awaits the footstep he will hear no more. Soon they will lead it away. Rudolph Valentino his master, will come no more to the Falcon’s Lair. 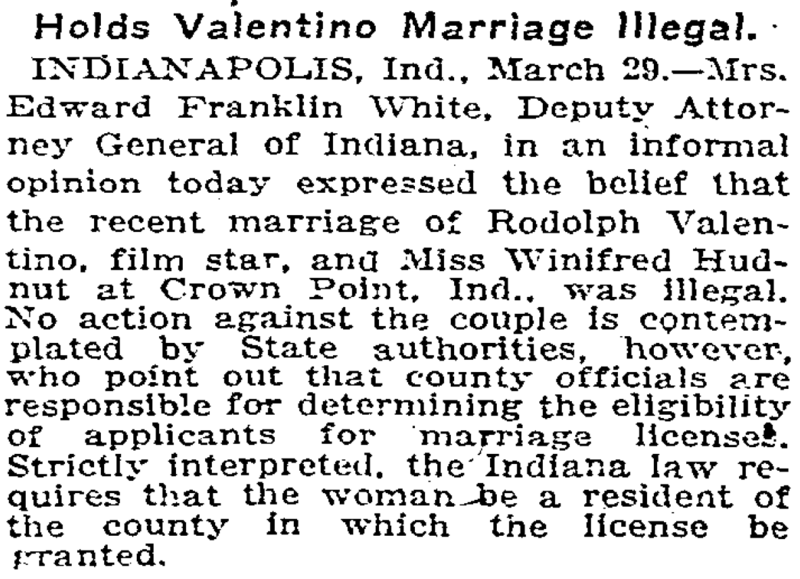 Rudolph Valentino is through with matrimony. “As long as I have to get my living from audiences of young women–married or unmarried–I consider it my duty to steer clear of marriage. 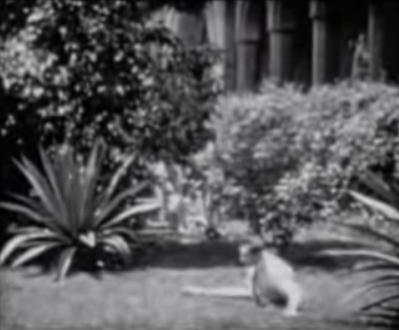 A married actor is never so romantic as an unmarried one to his feminine admirers,” he said.–22 Nov 1925, Valentino Says He Will Steer Clear of Matrimony; Denies Hatred for Wife’s Pekingese Dogs. 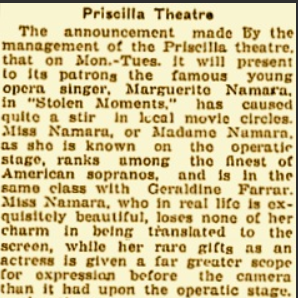 The movie “Stolen Moments” directed by James Vincent; story by H. Thompson Rich, distributed by Pioneer Film Corporation and released by American Cinema Corporation. This was the last film which Valentino played a villain. The movies cast: Marguerite Namara (Vera Blaine); Rudolph Valentine (Jose Dalmarez); Albert Barrett (Hugh Conway); Henrietta Simpson (Hugh’s Mother); Arthur Earl (Carlos the Butler); Walter Chapin (Richard Huntley); Aileen Pringle (Inez Salles); Alex Shannon (Campos Salles, her father); Gene Gauthier (Alvarez his son). Plot: Vera Blaine, is an orphan and the ward of rising young attorney Hugh Conway. Vera refuses a proposal from Hugh, her upright guardian because she is attracted to Jose Dalmarez, a Brazilian novelist visiting New York. Dalmarez gives Vera a photo of himself and Vera gives him a book of poetry that contains a romantic inscription inside the cover. However, Dalmarez has to return to Brazil for business and invites Vera to go with him. She takes this as a proposal of marriage and comes to his house with her mother’s wedding ring saying how romantic it would be to be married to him with her mother’s ring. He informs her that it was just an invitation to travel and she is horrified and flees the house. In the meantime, Dalmarez returns to Brazil. While there Dalmarez woos a local beauty named Inez who is the daughter of a local government official. Dalmarez and the government official’s son get into a fist fight when he observes Dalmarez kissing his sister. Years later, Dalmarez returns to the U.S. to consult a lawyer about criminal law for research on a book he is writing. Dalmarez is invited to dinner at the lawyers home who unbeknownst to Dalmarez is a friend to both Vera and her new husband Hugh Conway. Neither are aware of the past association of Vera and Dalmarez. When Dalmarez is alone with Vera he threatens to disclose her past unless she visits him. She does, and begs for the return of the book she had given him but he refuses. Dalmarez tries to kiss Vera they struggle, and she finds a heavy instrument striking him accidently killing him. Later on in the evening, a burglar enters the home and steals money and is initially blamed for the murder. The police let the burglar go because they believe the killer is a woman due to scratches on Dalmarezs face. A hairpin and a glove are found near the body. Vera returns the next night for the book and upon entering the house is discovered by Richard, who is investigating the murder case. Later that evening Campos returns through a window to obtain letters sent by his sister to Dalmarez, and is shot in a scuffle with Richard. Before dying Richard confesses to the murder of Dalmarez. Vera and her husband find happiness with the past safely behind them. The movie was shot in several locations. 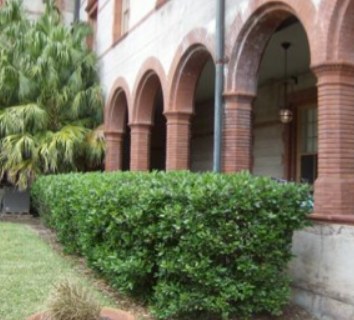 The Brazil scenes were filmed at Flagler College, St Augustine, Florida. 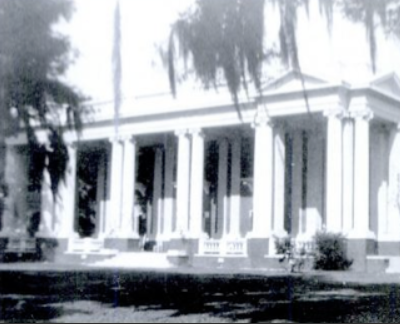 The rest of the movie was filmed at the Greenwich Plantation, and Bonaventure Cemetery, Savannah, Georgia. In 1923, Greenwich Plantation, Savannah, Georgia burned down. The only things that still exist that were in the movie are the fountain, statuary, and the reflecting pond. The Greenwich Plantation was located on the Wilmington River, with its manicured lawns, formal gardens and elegant white marble fountain was considered the most magnificent estate in the entire south. So those who are true fans of Rudolph Valentino that are ever in the Savanah or the St Augustine area there are still some places to visit that he was these many years before. 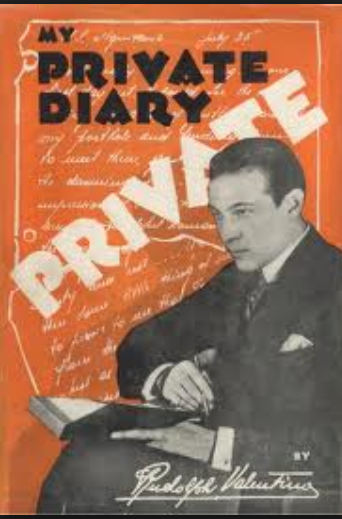 George Wehner is an unknown to most individuals who do not know a lot about Rudolph Valentino and Natacha Rambova. This article focuses on George how he was introduced to Natacha and the role of good friend he played in her life. Starting in 1921, after the death of his father George Wehner did a minor stint in vaudeville that occupied most of 1922. Wehner spent much of the rest of the decade focused on promoting his reputation as a medium; those efforts culminating in the publication of his autobiography in 1929. Perhaps Wehner’s most advantageous connection became the Richard Hudnut family. Wehner had been introduced to the designer, Natacha Rambova, in 1925 by her mother (Hudnut’s third wife) and he had begun leading regular weekly séances for them and their friends. He was invited to travel with Rambova and her entourage to Europe in 1926. 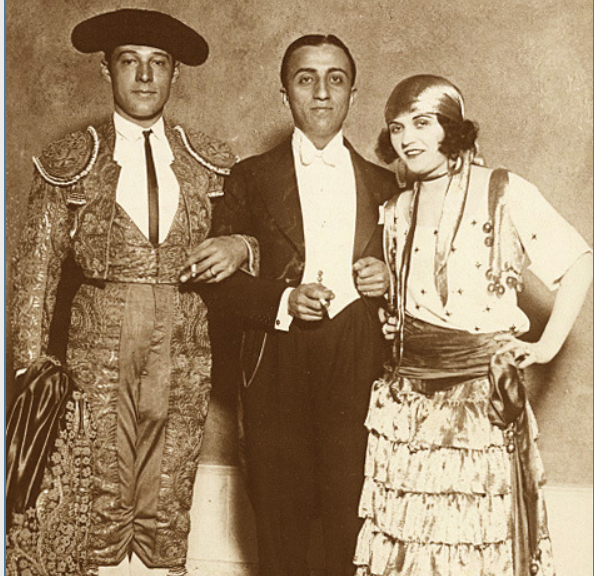 This trip provided Wehner with numerous opportunities to further his psychic career, but he reached the apex of his fame when he foretold the death of Rambova’s estranged husband, Rudolph Valentino, after the film star was hospitalized. He went on to console the grieving Rambova in a series of séances following Valentino’s death, in which he enabled Rambova to communicate with the spirit of the late actor. These incidents were widely publicized by Rambova in serial installments in the New York Graphic, which also were published in book form. It was Rambova who introduced Wehner to noted occult writer, Talbot Mundy, and his wife, Dawn Allen, in 1927. Mundy took an extreme interest in Wehner’s work, encouraging the publication of, and providing the introduction to, Wehner’s volume of memoirs in 1929. Wehner’s increasingly erratic behavior, however, soon would alienate Mundy, who later repudiated his belief in Wehner’s authenticity as a medium. By the early 1930s, Wehner appears to have abandoned “spiritual mediumship” as a profession and turned to writing fiction, as well as painting, as a career alternative. He exhibited his watercolors at galleries in New York City during the mid-1930s, alongside the work of close friends, Margrete Overbeck (who, as a high school student, had designed the official Denver city flag) and Katherine Winterburn. Wehner also began to compose music quite prolifically, turning out orchestral pieces, ballet scores and other works for the stage. Among his performed compositions from this period were songs used in concerts by Ernestine Schumann-Heink and Maria Maximovitch; ballets for Katya Sergava and Alexis Rotov; and symphonic pieces put on by the WNYC Concert Orchestra and the New York City Symphony Orchestra in 1940 and 1941. Throughout the 1940s, Wehner maintained a feverish work pace. He also began to regularly attend the Cantonese Theatre of New York. Classical Chinese theater and music would have a profound influence on his later works for the stage, such as the opera, The Mark of Kings (1961). Wehner began to work on an epic novel, The Bridge of Fire, which apparently never was published. His financial situation was eased considerably in his later years when Winterburn left the composer a bequest of money after her death. In 1949, Wehner purchased a former rooming house at 69 Cranberry Street in Brooklyn Heights, where he would live and work for the next twenty years. Wehner’s musical output became even more prodigious. During the last two decades of his life, he composed the music and wrote the librettos for fourteen operas. Several of these works, including The Amiable Beast, So Sings the Bell, and The Wild Swan were presented by the Heights Opera Company, under the direction of George O’Farrell, in concerts at parks throughout New York during the summer of 1961. In 1964, the same company produced Into the Silence at the New York World’s Fair, in addition to a Central Park performance. The following year, the Amato Opera Theater staged the American premiere of Three Days After. Wehner also created new ballet scores later in life. The Cockfight (1959), with a scenario by Romana Kryzanowska, was performed at a workshop that featured her son, Paul Mejia, then a student at the School of American Ballet. Wehner continued to compose nearly up until the time of his death. He had begun work on a new opera, inspired by Hiroshige’s The Fifty-Three Stages of the Tokaido, and had completed the first act before being taken seriously ill. Wehner passed away at Long Island College Hospital in Brooklyn on January 12, 1970.